Although the shoulder may be one of the most complex joints in the body, I’m here to help break down the facts for you! Two of the most important structures of the shoulder include the glenohumeral joint, referred to as the ball and socket joint; and the scapula, also commonly called the shoulder blade. 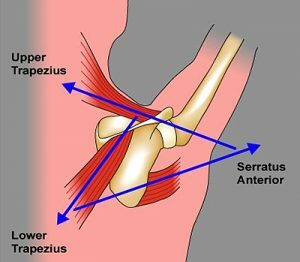 Two important muscle groups are attached to both of these structures – the rotator cuff muscles and scapular muscles. The rotator cuff is a collection of muscles that connect to the ball and socket joint to stabilize and help rotate the arm. 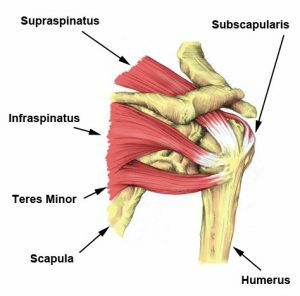 There are exactly four different muscles (supraspinatus, subscapularis, infraspinatus, and teres minor) that allow you lift your arm to the side and rotate your arm in different directions (i.e. putting on a jacket, reaching for the seatbelt, tucking in the back of your shirt, or fastening your bra). Fun Fact: You cannot fully raise your arm overhead without using your shoulder blade. 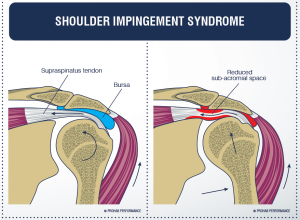 One of the most common shoulder injuries we see in the clinic is shoulder impingement and it is often caused by poor posture and muscle imbalances that disturb proper movement, which we like to call scapulohumeral rhythm. The arm and shoulder blade coordinate movement together, so for full 180 degrees of overhead movement, there should be about 60 degrees of upward rotation in the shoulder blade. If the shoulder blade gets stuck or moves incorrectly it can cause pain and immobility. There are three important muscles in the shoulder blade that have to work together for the arm to properly move upward. Imagine these three muscles as a team. Each muscle has an important responsibility and they depend on each other to achieve proper arm movement. If one teammate is too weak or too strong, it can disturb proper rhythm, leading to pain and dysfunction. Poor posture is almost always to blame and one key player involved in particular is the upper trapezius. In the case of shoulder impingement, the upper trapezius is often overworked, causing the shoulder blade to hike up, pulling the shoulder into a bad position. This overactive upper trapezius also makes it difficult for the lower trapezius and serratus anterior to perform their duties, turning them into lazy team slackers. A skilled physical therapist can assist you to help improve scapular strength and identify areas of weakness or overuse. They can also use hands-on techniques to reposition and mobilize the scapula so it glides smoothly with appropriate muscle recruitment. If you work or sit for long periods of time, listen up! Sitting hunched over with your shoulders scrunched up and your head forward places the shoulder in a very vulnerable position. When the shoulders are rounded forward, the space where the rotator cuff muscles slide and glide becomes cramped, reducing the space needed for movement. This results in pain and can create micro tears in the rotator cuff muscles. If this continues for long periods of time with repetitive movements, the muscles can lose integrity and partially or completely tear! Fun Fact: Another key muscle group that can cause disturbances to proper shoulder placement is the anterior chest muscles along the front of the chest. Tight chest muscles will round the shoulders even more forward, further reducing the space for the rotator cuff muscles. The great thing is that there are simple exercises you can do throughout the day to not only help strengthen your postural muscles, but help you become more mindful of your movement and posture. At Complete Physical Therapy we advise our patients to perform postural exercises at least once an hour to effectively enhance posture. Click the PDF below for pictures and descriptions of these exercises so you can start improving your posture today! Stay tuned for another blog post with progressions of advanced strengthening exercises you can perform to improve rotator cuff and scapular strength. This entry was posted in Allison Blog, Blog. Bookmark the permalink.